ChairMate High Chair - Benson is rated 4.8 out of 5 by 9. Mealtimes can make a big mess. Created by the leading designers at Ingenuity, this compact feeding chair is small and smart enough to minimize both space and kitchen cleanup. You can enjoy all the benefits of a full-sized high chair in an easy clean and portable chair-top design. 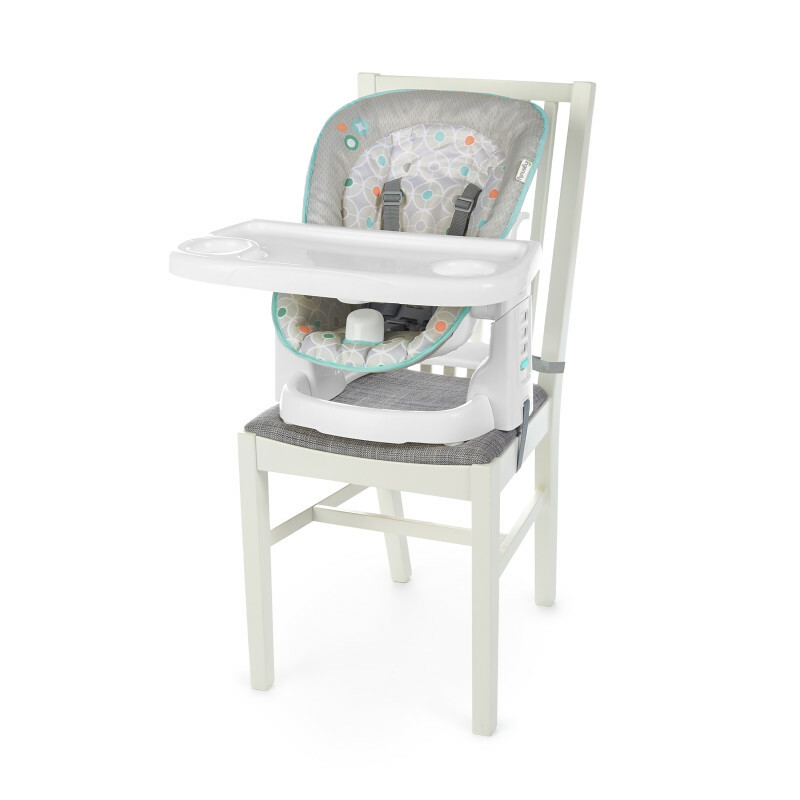 Safely strap the baby seat to your dining chair to give your little one a seat at the table. Four adjustable height positions will fit nearly any table. The Crumbless Corner seat pad wraps around the edges of the chair, so you won’t have to worry about food getting trapped in the cracks or seams. To make kitchen cleanup even easier, the EasyClean tray detaches and is dishwasher-safe. Its intelligent design keeps the tray level even when the seat is reclined. When your baby grows up, so does this high chair. It converts into a booster seat for toddler years, too. Whether dining at home or on-the-go, this easy travel high chair makes mealtime a breeze. Dimension (in) 22.25" x 21.25" x 24.5"
Seatpad - Remove from frame. Machine wash with cold water, gentle cycle. No bleach. Tumble dry, low heat.Frame – Wipe plastic frame with a soft, clean cloth and mild soap.Tray – Dishwasher safe. Wipe clean with a soft, clean cloth and mild soap.Harness/Straps – Machine wash with cold water, gentle cycle. No bleach. Air Dry. Rated 5 out of 5 by Rebekah from This is perfect for travel! It's compact but perfect size for growth! We love this! We've carried it with us to the grandparent's house and it fits in multiple different chairs and isn't too big to carry in the car. Rated 4 out of 5 by GillianMB84 from Small footprint chair! So far, we have enjoyed using our Chairmate highchair in Benson. The chair is a great option if you you don't have space for a bigger chair. It's well made and secure...and can handle all of the wriggling of your little one. Although the design is pretty simple, I feel like it could be stream lined a little bit, but it's easy to clean nonetheless. Cute fabric too! Rated 5 out of 5 by MrsLanier from Great little highchair This highchair is great in the fact that it’s compact and still has everything you need to feed your little one safely. The seat adjusts easily it’s a matter of pushing a button. Also I love how the feeding tray slides on and off easily by two levers in the side. It’s a very cleaver but simple design. My little guy loves this chair it seems pretty comfortable for him and that’s really all that matters! Rated 5 out of 5 by MrsLanier from Great little highchair This highchair is great in the fact that it's compact and still has everything you need to feed your little one safely. The seat adjusts easily it's a matter of pushing a button. Also I love how the feeding tray slides on and off easily by two levers in the side. It's a very cleaver but simple design. My little guy loves this chair it seems pretty comfortable for him and that's really all that matters! Rated 5 out of 5 by Justme from Great chair! Well made, secure and comfortable! Easy to attach and easy to clean. Rated 4 out of 5 by NR1818 from Nice space saver chair We got this so we could stop using a big highchair that we had to keep in the corner of the kitchen and drag over every use. This has a safe base so I feel good putting my 7 month old in it. It has a tilt so he could be back a little but we keep it straight up. The pros - the tray slides on and off easily, the fabric wipes up nicely and the colors are cute, the straps adjust easily, and it can be raised or lowered based on need. The cons - it doesn't go low enough to slip under our table at all so the chair is pushed out now. Also my 7 month old has pretty chunky thighs so while it isn't tight where his legs go, it does seem like if he had any bigger legs he may be a little snug. But I'd recommend this to friends! Rated 5 out of 5 by allen2012 from Great purchase Great features, easy to set up and clean up! Great product! !